Big Wins for Working Families in Midterm Elections! CWAers across the country won major victories for working families on Election Day, electing strong, pro-worker candidates who will change the face of Congress, state houses, and hundreds of local and municipal offices from coast-to-coast, and passing ballot measures that will increase wages and strengthen our democracy. CWA members and retirees led a sophisticated political program and a year-long effort to highlight the failed promises of the Republican corporate tax cut bill that made the difference in some of the most competitive races of the 2018 midterm election. "This election represents a beginning, not an end," said CWA President Chris Shelton. "CWA members are ready to make sure that a progressive pro-worker agenda that puts the needs of working families ahead of corporate CEOs and Wall Street bankers is at the center of the discussion in Congress, in state capitals, and in communities across the country." Informed by deep experience organizing in some of the toughest right-to-work states, CWA's program went beyond traditional party politics. Trained CWA activists engaged in issues-based electoral work to build the power that is necessary to change our economy and strengthen our democracy. They set up canvasses, managed phone banks, and used new peer-to-peer texting platforms to reach out to CWA members, retirees, and the general public during this election cycle. 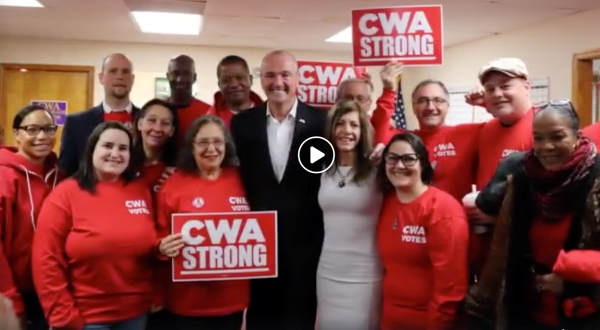 Check out this video from CWA's political program highlighting the accomplishments of CWA members and retirees in the midterm elections. Click here for state-by-state highlights of CWA's election work.